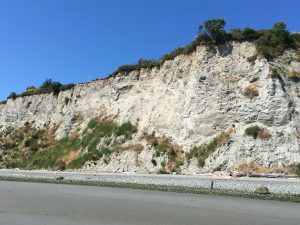 My last blog was about the benefit of establishing a Sit Spot in nature. If there is personal benefit from having your own Sit Spot, what could be accomplished by Community Sit Spots? 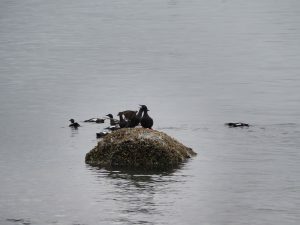 Whidbey Island Audubon Society with support from the Island County Marine Resources Committee has sent 40-60 volunteers out to island beaches for one hour of Sit Spot activity every week from mid June to mid August for the past thirteen summers. Nesting pigeon guillemots are the main focus of the volunteer’s Sit Spot observations. 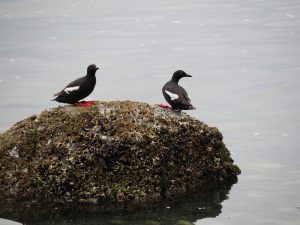 About a thousand of these dark brown, 13-inch sea birds with white wing patches and bright red feet nest on the high cliffs of Whidbey Island. These little birds are just plain fun to watch. Because their feet are set far back on their bodies, they can swim quickly underwater to catch prey. However, that makes them “out of balance” for water landings. They appear to crash into the water rather than land on it. 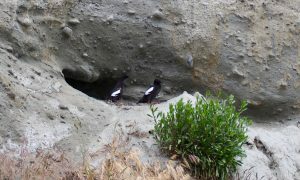 Yet, with fish in their beaks, they somehow manage to fly into small cliff holes to feed their little chicks. Their presence on Whidbey Island is a good indicator of healthy coastal waters—i.e. the availability of good forage fish like gunnels, cod, and sculpin. They are mysterious little birds. When the chicks are ready to leave their burrows (usually at night), they literally jump off their cliffs and walk into the sea ready to care for themselves. We don’t know much about where our local pigeon guillemots (PGs) disperse after their nesting season ends in late August. However, we do know that all PGs feed on benthic or bottom dwelling fish, so they can never live too far from the shallower waters close to land. We believe our PGs disperse throughout Puget Sound and Washington coastal waters. What does it look like to be a PG observer? 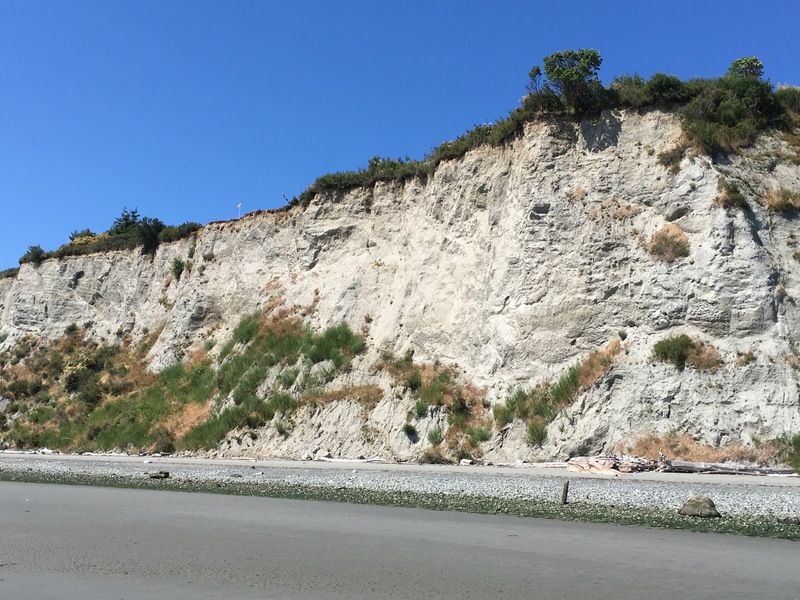 On a recent July day I joined two team members and headed down to our assigned beach. 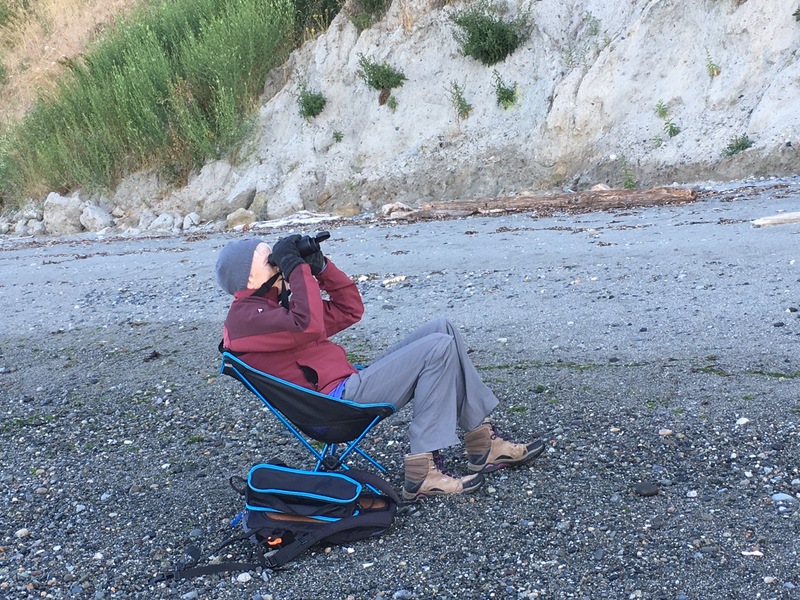 We had our camp chairs set up by 7:35 a.m. and sat perched with binoculars for one hour of watching PGs fly in and out of their cliff holes—writing down the exact minute each VB (visit to burrow) or FB (fish to burrow) occurs. This data is entered electronically and coordinated by several of our local Audubon members. While we are watching PGs, we also see eagles soar by and great blue herons fish on the shoreline. We hear osprey calling their prideful boasts of recently caught fish. On windless mornings the sweet murmurings of PGs gathering next to the shoreline fill the air. All the while, goldfinches are darting in and out of shoreline vegetation gathering seeds. Everywhere Nature is in full summer swing! What a radical thing to do! Pause. Observe. Appreciate. Reflect on the wonder of Nature’s miraculous ways—contributing to the work of citizen science. Lovely blog, Ann. This is my 12th year doing the PG surveys, but I hadn’t made the Sit Spot association. That perfectly describes the experience! As well as delighting in the antics and devoted parenting of the guillemots, I’ve observed many kinds of land, shore and water birds along with seals. During yesterday morning’s misty sit, I was captivated by a tiny spider working on her web hanging from a large drift log just above my head where I had to scrunch my chair in beneath it to be able to see the burrows at high tide. I’m so thankful to have had this commitment that has made me devote this hours to quiet beach sitting and nature watching. Wonderful story and a wonderful hour of observation for you – thanks for the details! RP and I have enjoyed much time observing many birds in our garden as they are especially in abundance this year – the wonder of all of these beautiful and rustic birds choosing to live in the city, of all places. They amaze and delight us daily – calming factors. Aren’t we lucky all of us who observe the birds! Thanks for helping to teach this practice – we are better for it. This is wonderful to read, Annie. Your writing makes me feel as if I were sitting there with you! Ann you are such a great observer. I never knew Osprey boasted over their fish catches – now I will listen for that! You captured the feeling and benefits of participating in the Pigeon Guillemot study so very well. I have been doing this since the study started and still feel a thrill when one flies to a burrow with food. It can be frustrating when one of them is sitting on the water in front of you with food, but the hour is up before they deliver or worse yet the eagle flies over sending them all further out before you leave. Thank you. A delightful read half a world away in south east Queensland, Australia. Thank you, Anne, for this example of how “sitting” can be very active – an act of engagement that re-members, restores, human community and creature/created community. A blessing. Copyright ©2018 PeerSpirit Inc. All rights reserved.